joy magnetism: Happy birthday, Mr. President! John F. Kennedy was born today in 1917. 1917!!! He would have been 93 today. Sigh. Still hot. Even now. I'da voted for him, too. I'm just sayin'. Seriously. Also. Is it bad of me to post this Marilyn Happy Birthday vid, which (if you notice on the vid) she sang it 10 days earlier at his 45th birthday celebration. 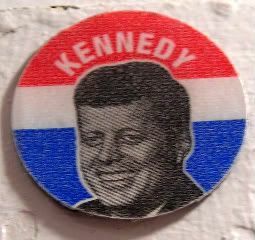 Incidentally, even though I just bought that 50-president magnet set (yes, there were extras iconic picture magnets in the pack, in case you were wondering why I can't count, even though I really can't), this is the magnet I made out of the Kennedy Presidential Library & Museum entry sticker. Don't worry, I bought two other museum magnets - one featuring the building, the other featuring his campaigns. Good grief. That makes four Kennedy magnets. By the way, I've noticed there's a return visitor who has been spending inordinate amounts of time - seriously, hours, just this week - on joy magnetism. I welcome the visits, but am starting to worry that you're not human and it kinda freaks me out. If you wouldn't mind posting just a comment to let me know you're human, that would be fantastic. My interactive boys say that I should be reporting and/or blocking you, but if you're a magnet person, I don't want to do that. So please help a gal out? Please and thank you. Um? That person might be me? I have a pretty decent magnet collection and have been checking out whatever else I could find on the web. After seeing your and magnetic mira's magnet blogs, I was toying with the idea of starting one myself. So, yeah, I have been checking out your page this week. But please keep in mind there's a whole lot of stuff here to read for someone who just found it this week. And I'm not looking at it for hours (at least, I didn't think so...). I just have the page open and come back, look for awhile, then do something else, and so on. Sorry if it freaked you. To be honest, I'm a little freaked myself. Hi Elizabeth! Thanks for posting, and spending time reading my little magnetblog. I always yell at my sisters because they just like to leave my site up and then run away. I was just worried because my interactive guys were like, oh, noes, that's not a human, get the spambot!!! So, thank you so very much for coming forward. Do come back and let me know when your site is up! Would love the company!